24hr reception, concierge service, express check-in/check out, safe at reception, languages spoken: Arabic, French, English, Spanish, German, gardens, terraces, rooftop swimming pool, salon with a large collection of books, restaurant and bar service, private cooking classes, traditional hammam and spa treatment room, mint tea and Moroccan patisseries on arrival; mineral water, fruit basket & flowers in bedroom on arrival; milk & cookies and turn-down service in bedroom every evening; in winter time, the fireplaces are lit and hot water bottles are used to warm the beds; bathroom toiletries; tea-time between 4pm and 5pm; international newspaper every day; shoe-shine service every evening; wifi throughout the riad; patisseries to take home on departure, Faxing, copying and printing is available on request. Doctor available on call if required. 9 rooms within three categories: superior, deluxe and suites. All rooms have an en-suite bath/shower room, complimentary toiletries, hair-dryer, AC/heat, telephone, and bathrobes, towels and slippers are provided. There are 4 Superior rooms: rooms 1 & 2 on the first floor have views to the small courtyard and share a private terrace. Room 1 has a queen-sized bed whilst room 2 has twin beds, making them ideal for families; Rooms 7 & 8 are on the ground floor, both have queen-sized beds, views to the large courtyard and both rooms share a fireplace alcove and sitting area. The 3 Deluxe rooms are on the first floor: room 4 has a queen-sized bed and a balcony that looks out over the large courtyard garden; rooms 5 & 6 are inter-connecting. Room 5 has a queen-sized bed whilst room 6 has twin beds. Both rooms have views to the large courtyard garden and can accommodate an extra bed if necessary. There are two spacious Suites (rooms 3 and 9) each with a queen-sized bed and a private terrace with sun-loungers, tables and chairs. Room 3 has views to the large courtyard garden. Room 9 has an ante-room with single bed and views to the large courtyard garden and the medina. The Suites can accommodate 2 extra beds if necessary. Whilst we will endeavour to provide specific rooms when requested, we cannot guarantee specific room numbers, rather that the category of room will be provided. Room prices are room only for 1 or 2 adults. Extra adult (12 years plus) = 70 euros per person per night. Extra child (5-12 years) = 35 euros per person per night. Children under 5 years are accommodated free of charge and a cot can be provided on request. Moroccan taxes are charged on top of room rates: Taxe Hotelier is 10% of stay; Taxe Promotion Touristique is 3.50 euros per person per night. Breakfast is 11 euros per person per day, half board is 25 euros per person per day, full board is 35 euros per person per day. 28 days prior to arrival, 50% of stay; 14 days before, or no-show, 100% of stay. No show: is considered a no-show for any client not present by 22h00 the evening of the planned arrival date unless otherwise advised. During Holiday Season all bookings are considered final (no cancellation) and must be settled in advance. A restaurant service is provided throughout the day for breakfast, lunch, dinner and snacks. Guests can choose to dine in the dining room, in a bhou (small lounge), in the garden or on one of the many terraces. All food is home-made and the menu is daily-changing based on the fresh seasonal produce available at the time of your stay. A bar service is available and guests can choose where to take their drink. Room service is available. The hotel can accommodate wedding receptions, subject to the party renting the entire riad for exclusive use. Please contact us for an individual quotation. A rooftop swimming pool available throughout the year. 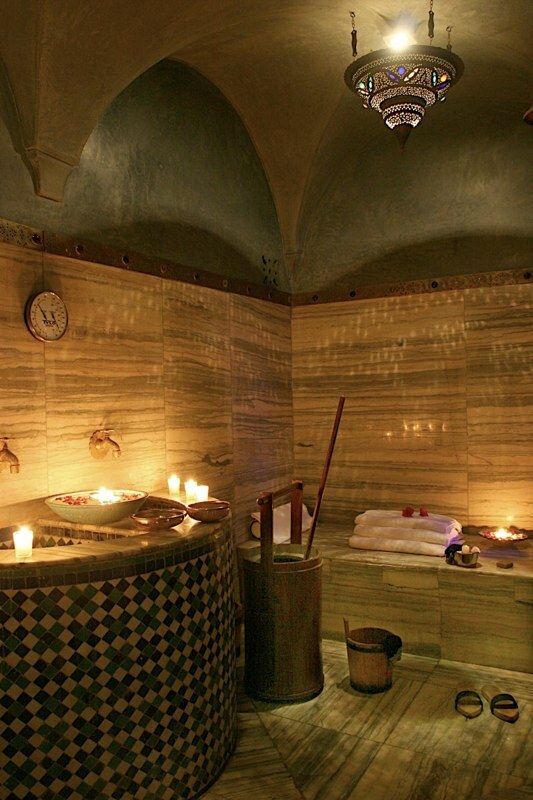 A traditional hammam (steam bath) and spa treatment room available for daily treatments. Hammam prices are from 250 MAD per person and massage prices are from 380 MAD per person. A range of beauty treatments are available. Own range of products, based on Moroccan Argan oil, are used for the treatments. Smoking is permitted in the riad. The hotel is very centrally located in the heart of the old medina of Marrakech, just steps from the main square, the Jemaa El Fna. There are several major sites all within a 10 minute walk of the hotel: Badii Palace, Saadian Tombs, Dar Si Said Museum, Maison Tiskiwin Museum, the historic Mellah neighbourhood and, the Bahia Palace which was previously linked to the Riad by secret underground tunnels. All of the major sites of interest are within walking distance of the riad. The taxi station is just a 2 minute walk from the riad. Parking is available at a 2 minute walk from the riad and the charge is approximately 1 euro per day. Marrakech airport, 15 minutes drive from the riad. Riad can arrange a registered tour guide for a half day or full day tour of Marrakech medina. Can also arrange for a visit to Ourika, Imlil, Kasbah Toubkal, Lalla Takerkoust, Oukaimden, Tinmal, Asni, Ouzoud, Essaouira, Ouarzazate, and other areas on request. The riad is very centrally located in the heart of the old medina of Marrakech, just steps from the main square, the Jemaa El Fna. There are several major sites all within a 10 minute walk of the hotel: Badii Palace, Saadian Tombs, Dar Si Said Museum, Maison Tiskiwin Museum, the historic Mellah neighbourhood and, the Bahia Palace which was previously linked to the Riad by secret underground tunnels.